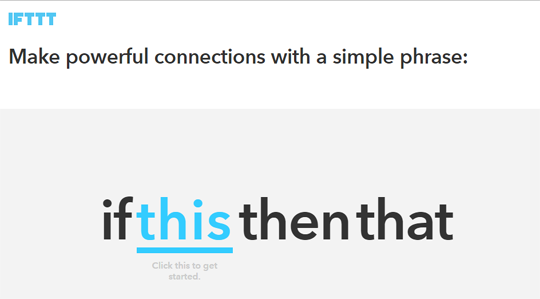 IFTTT better known as IF This Then That. It is a free web service that allows you to connect and organize your different accounts at just one place. The very first thing you need to do is to sign up for IFTTT account. 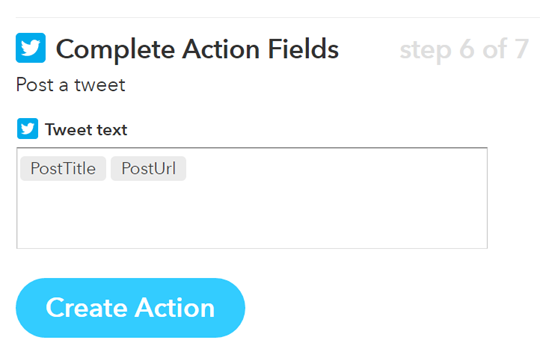 After creating a account at IFTTT, it will show you how it works. 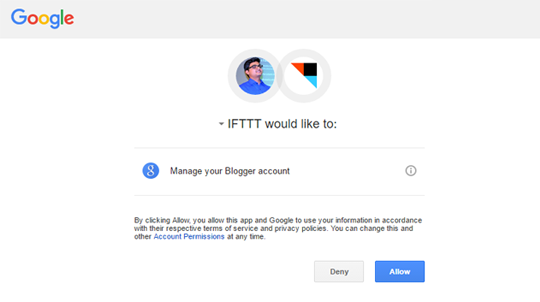 It will ask you to follow few instructions before you can access your IFTTT dashboard. After following a couple of instructions, it will ask you to select channels that interests you. Since, we are working for Twitter, we will go on to choose it as our channel. But, you need to select two more channels to move on to the next step so select as per your liking and press "Continue". 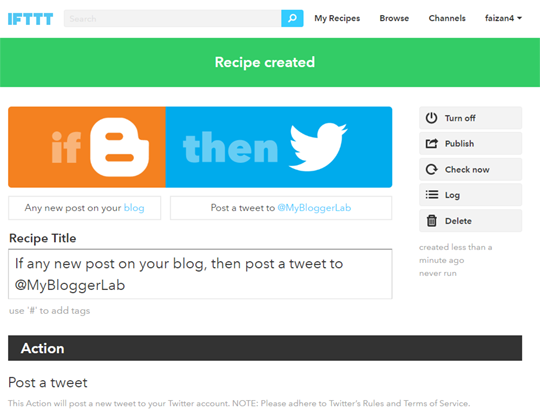 Now we need to create a process that IFTTT calls "Recipe", Click on the "My Recipes" link present at the top of the dashboard. 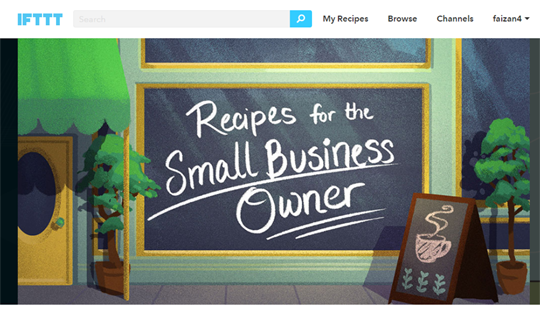 Now click on "Create a Recipe" button and proceed to the next step. 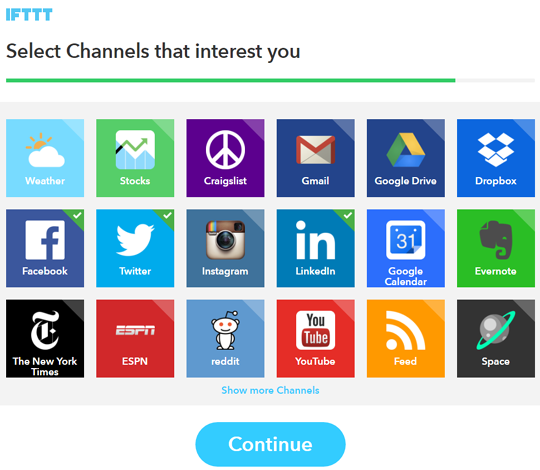 Now IFTTT will show you a list of channels that you can connect. It will act as the trigger like if your Blogger blog has a new post then [do something]. So, select Blogger from the list or search it in the search box. 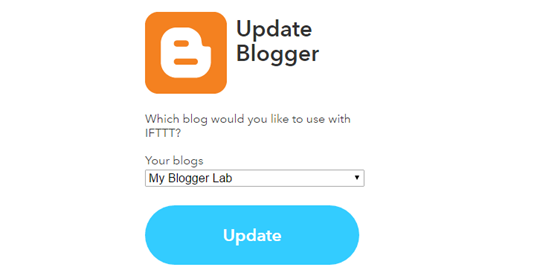 IFTTT will now ask you to connect to your Blogger account, simply click on the "Connect" button to continue. 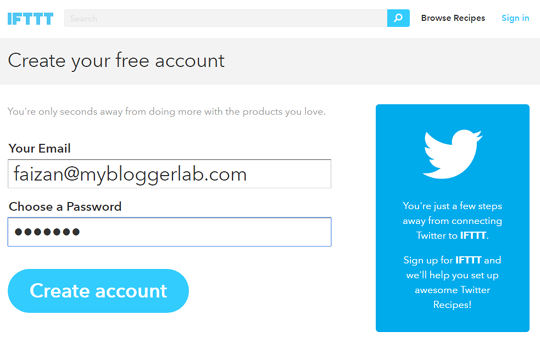 A window will pop on your screen asking you to verify your Blogger account, follow the instructions and verify your account. You must be logged in to your Gmail Blogger account before you can verify it. So, make sure you are logged in to the correct account. After logging in, press the "Allow" button to proceed to the next step. After pressing the "Allow" button, it will show you the list of your Blogger blogs. Select a blog that you would like to use and press "Update". 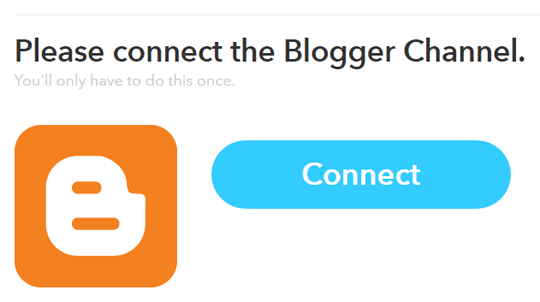 IFTTT, will not try to connect to Blogger and once it is done it will show you a message that "Blogger is connected successfully". Now, click on 'Continue to next step’ button. Now IFTTT will provide you a list or triggers that you can use. 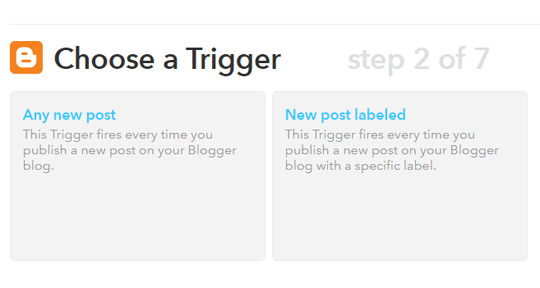 You can choose a trigger that fires whenever you publish a new post on your Blogger blog or when you publish a post on Blogger in a specific Label. Since, we want to publish our all posts so we will choose "Any New Posts" and proceed to the next step. Now we have completely setup the "This" statement now we need to work on "That" statement, so click on "Create Trigger". Click on "That" link, in which we will basically define the type of actions that our recipe will perform after you publish a new post on your Blogger account. Now you will see a huge list of services that you can auto-publish your blogger posts. Since, we are working for Twitter we will choose twitter. However, you can also choose any other social channel as well like Facebook, Google+, Linkden and etc. Now you need to connect your twitter account so whenever a new post is published on your Blogger Blog, it can also get auto-publish on your connected twitter account. 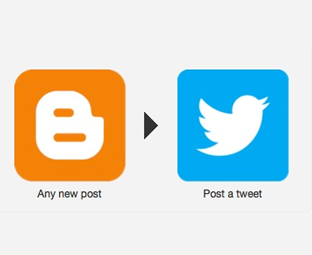 You just need to authorize the IFTTT App to access your twitter account and publish tweets on your behalf. Simply, press the "Authorize" button. 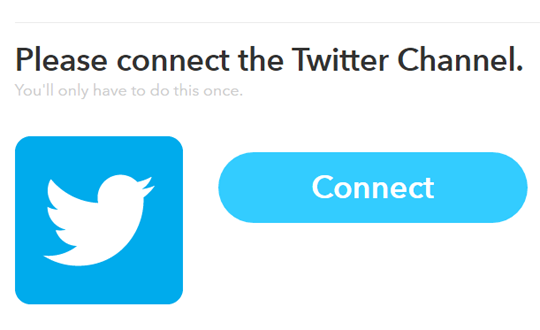 IFTTT, will not try to connect to Twitter and once it is done it will show you a message that "Twitter is connected successfully. Now, click on 'Continue to next step’ button. 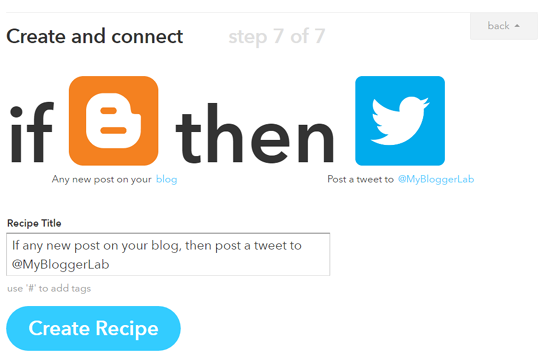 Now IFTTT, will provide you the number of actions that it can perform whenever a new post is made to your blogger site, either post a tweet, post a tweet with image and etc. For now, we will choose "Post a Tweet", and move to the next step. From here you can decided how your tweet will look like. It can hold your Blogger post title, post URL, Image URL, and etc. But tweets are happen to be short so we will go with just post title and post URL. 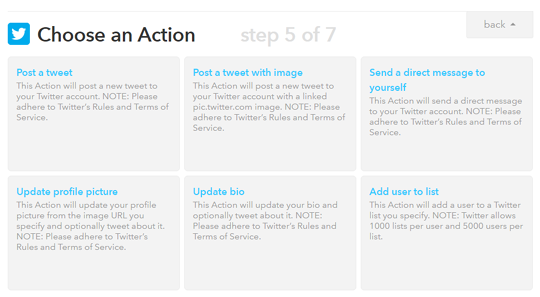 After customizing how your tweet will appear, press "Create Action". Now we are coming towards ending of our recipe for auto-publish Blogger posts on twitter. Simply, name your recipe and press the "Create Recipe" button to complete the process. Finally, your recipe is created. Now whenever you will publish a new post on your Blogger blog, it will automatically publish a tweet on your twitter account with the title and URL of that particular post. You can visit "My recipes" page to see your all list of recipes. You can always edit, stop, or resume any recipe as per your liking. We hope this tutorial have helped you in learning how to auto-publish Blogger posts to twitter. In coming days, we will teach you to create more recipes for different social networking websites. Till then, feel free to subscribe to us on Facebook, Twitter or Google+.